*Ascension Lutheran Church, Danville, VA, holds the copyright on the word "Chrismons". It was given to them by Mrs. Frances Spencer, who originated the concept and brought it to fruition in that church in 1957. Please note that this web site (www.umcs.org) is not related to the one at the Ascension Lutheran Church of Danville, VA in any way. Their web site has books and DVDs for sale about Chrismons. I suggest you go there for the first and last word on Chrismons, including how to place them on a tree, and much, much more. Chrismons may never be made for profit. Hence, you should not find commercially made Chrismons or kits to make them. 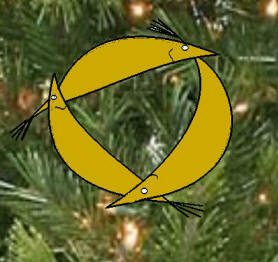 Chrismons are a type of Christmas Tree decoration used in many churches and often in the homes of Christians. The symbols used represent a variety of biblical and theological concepts that are well known among most believers. 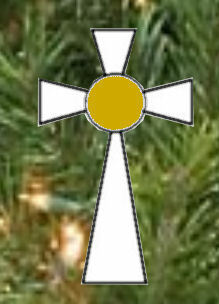 Often, if the ornaments on a Christmas tree are comprised mostly of Christian symbols, the tree is known as a "Chrismon Tree." 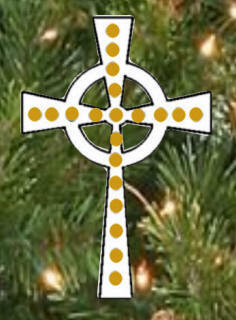 Chrismons are white with gold decorations of beads, ribbon, glitter, etc. It is common, however, to see these ancient Christian designs in other colors than white and gold. These would not be Chrismons, however, but simply Christian symbols -- and there's nothing wrong with that! THE PURPOSE: A WONDERFUL CHURCH FELLOWSHIP AND CHRISTIAN EDUCATION PROJECT! 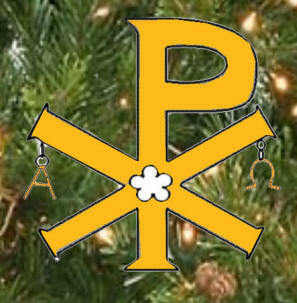 Gather your church group together, study what these symbols mean, and make a collection of them as ornaments for your church and hang them on a tree! The idea is to have fellowship and learn, as much as it is to create something beautiful for your church. Use these symbols to create needlepoint or posters or wall hangings, as well. Incorporate them into church art! Be creative! But, please don't skip the process of making them, yourself, as this would defeat the purpose! A page of Christian Symbols with explanations of their meanings. Black and white graphics that may be used as patterns. Download a booklet of these symbols (Adobe Reader format). Download a zipfile of the graphics and explanations. Making Ornaments and Chrismons and what you'll need. This is a symbol of the Holy Trinity. The fish are an ancient symbol for Christ, the Greek word for "Fish" forming an acrostic that spells out "Jesus Christ, Son of God, Savior." The Eight Pointed Star is a symbol of regeneration and baptism. This symbolism is enhanced by the golden orbs, also symbols of the world. 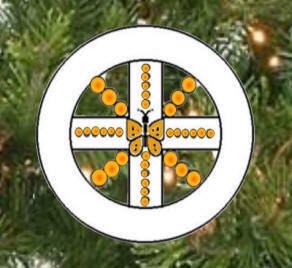 This symbol reminds us that Christ came to save the world. Did you know that you can make an eight pointed star without taking your pencil off the paper? of how the angels went to simple shepherds to tell them the news of the Savior's birth. "Glory to God in the Highest!" they sang. 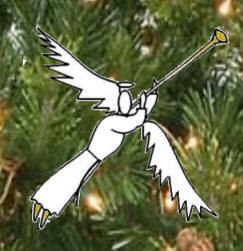 Angel symbols reminds us that the Gospel is for us and for all. This one is complex, having several symbols. The circles represent the earth. The cross represents Christ's death. The butterfly represents the resurrection. The story told here is that Christ came to save the world by his death and resurrection. We have eternal life through him. This cross, also a Celtic Cross, is a bit more ornamental. Nevertheless, it means about the same thing as the cross, above and is a commonly seen symbol. 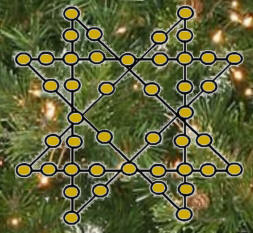 This is another complex symbol. The "X"and "P" is the Greek letter "Chi" and "Rho" superimposed. They are the first two letters in the name "Christ" spelled in Greek (Xpistos). The "A" and upsidedown "U" are the Greek letters, "Alpha" and "Omega," the first and last letters of the Greek alphabet. Together they represent Jesus' words: "I am the Alpha and the Omega, the first and the last, the beginning and the end." *Ascension Lutheran Church, Danville, VA, holds the copyright on the word "Chrismons". It was given to them by Mrs. Frances Spencer, who originated the concept and brought it to fruition in that church in 1957. Please note that this web site (www.umcs.org) is not related to the one at the Ascension Lutheran Church of Danville, VA in any way. Their web site has wonderful books and DVDs for sale about Chrismons. I suggest you go there for the first and last word on Chrismons.